The Dante Quartet, one of the UK’s finest ensembles, is known for its imaginative programming and impassioned performances. The Dante Quartet has been honoured with the Royal Philharmonic Society Award for Chamber Music and has also received international awards for its recordings. 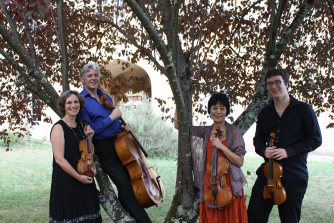 The wide age-range of the Dante Quartet’s members helps to create a harmonious and exciting blend, marrying youthful enthusiasm with richness of experience and consummate technical skill.